Y’all know I’m from Oklahoma, right? Ali texted me for bean salsa input the other day and I mentioned that she wasn’t far off from cowboy caviar, a bean salad recipe popular in the South. You can serve it as a side salad or as salsa. Either way, people go crazy for cowboy caviar at potlucks. Ali wasn’t familiar with cowboy caviar (also called Texas caviar), so I worried that maybe you all had been deprived of this cheekily titled delight, too. 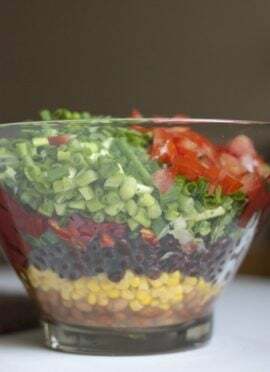 Cowboy caviar is made with black-eyed peas and black beans, chopped tomatoes, corn, bell pepper, onion and cilantro tossed in a tangy Italian dressing. I have one issue with most cowboy caviar recipes, which is that they’re often swimming in store-bought Italian salad dressing. As such, they can be way too oily and contain some entirely unnecessary preservatives. I whisked together a simple, homemade Italian dressing from scratch instead of using store-bought. This recipe yields quite a lot of dip, but I don’t think you’ll have any trouble polishing it off. I had so much fun creating a healthier version of this classic potluck menu item that I thought it would be fun to make a summer series out of it. 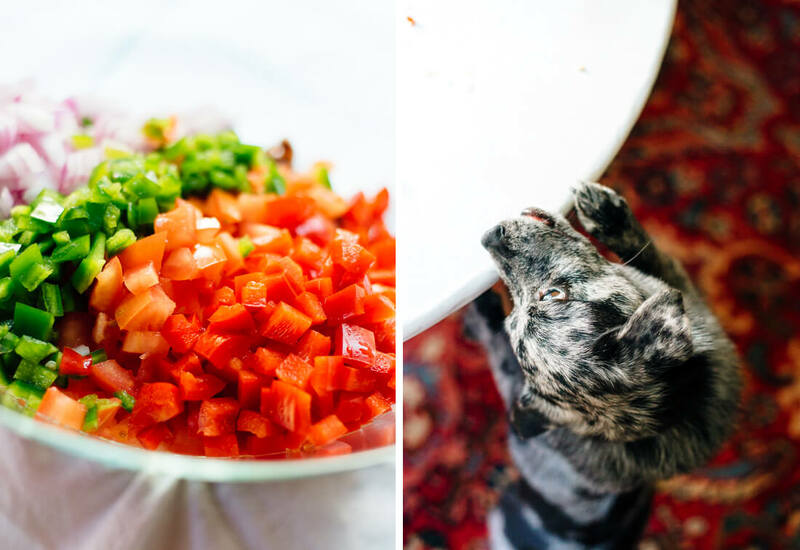 On the menu: seven-layer dip, pasta salad, more salsas… What else would you all like to see?! Let me know in the comments! 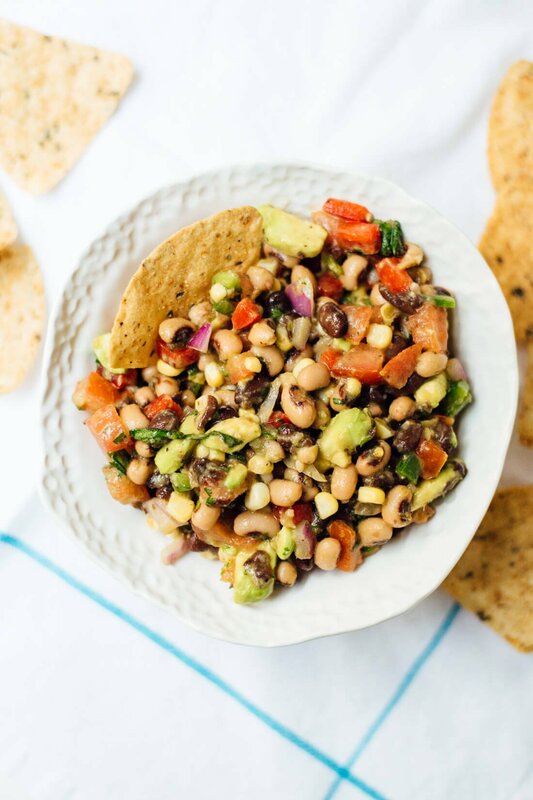 This healthy cowboy caviar recipe (also known as Texas caviar) is made from scratch with all-natural ingredients! Serve it as a dip, salsa or salad—it’ll be a hit at your next party. Recipe yields a lot of “caviar,” about 8 cups. In a large serving bowl, combine the drained black-eyed peas, black beans, corn, chopped tomatoes, bell pepper, onion, cilantro and jalapeño. If you’ll be including avocado, wait to dice it until you’re ready to serve the dip, so it doesn’t turn brown in the meantime. In a cup, whisk together the dressing ingredients until emulsified. Drizzle the dressing over the serving bowl and toss until well mixed. Season to taste with additional salt and pepper. For best flavor, let the mixture marinate for at least 20 minutes before serving. If you’re adding avocado, mix it in just before serving. Recipe based on memory and roughly adapted from AllRecipes. Serving suggestions: Don’t forget the chips! I also like to turn this dip into a green salad by serving it on lettuce with a squeeze of lime, some crumbled feta and a sprinkle of crushed corn chips or toasted pepitas. Storage suggestions: This dip keeps well in the refrigerator, covered, for around three days. If you love this recipe: Check out my other salsa recipes and my healthy barbecue salads and sides roundup! Well, I’m not really a cowboy being from Buffalo, NY…yes, the land of the Buffalo Bills and the Sabres. Bleh. But I know my wife will love this recipe, totally up her alley as to what she makes and yes, brings to all those potlucks and other summer festivities. We’d love some more salsa recipes! Never tire of those!!!!! Ha, that’s ok, I’m not a cowboy, either. :) I have a few more salsa recipes planned for the summer! YUM! That’s my kind of caviar ;) haha I would love with chips OR a spoon! Haha, jalapeños are one of the only foods that Cookie refuses to eat! So funny. Yum! 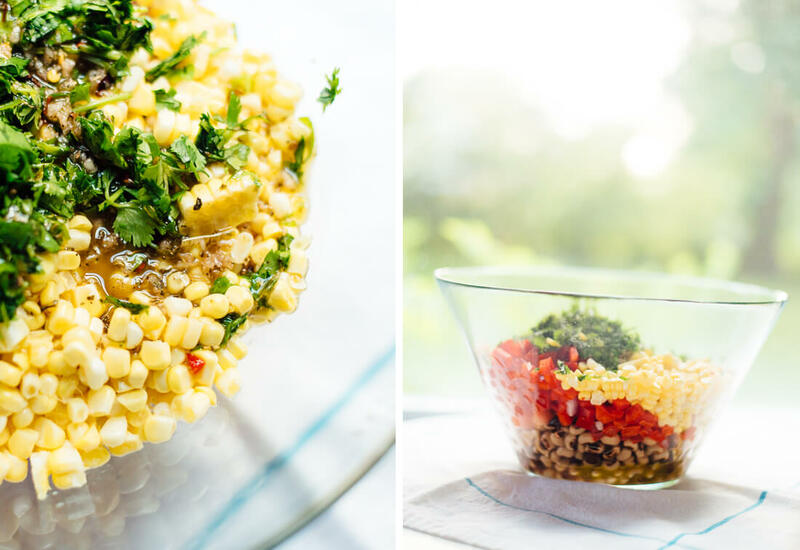 I cannot get enough corn this time of year, and I’m LOVING that dressing idea! Pinned! I love cowboy caviar! I’m a Texas girl and we eat this stuff by the buckets. So spicy and delicious! Gotta have it with black-eyed peas, too! Yes! Glad you know this salad, Heather! Hey Autumn! :) Hope you all love it! I’ve made Mexican Caviar (similar). I like this one, too…nice ingredients; yummy! YES! I’m not from the south, but I have had this at a party or two (but it’s been years!) and I had the same thought that it could be vastly improved with a homemade vinaigrette. I can’t wait to try yours! Yeahhh! Glad we’re on the same page here, Nicole! Hope you love it! Hi Mandy! Hope you enjoy this salad. Here are a couple of resources that might help you find some recipes that work for you: my recipes that pack well for lunch and readers’ favorite recipes. Dang, that’s a lot of sugar! If you’re used to your “caviar” being super sweet, you might want to add some more maple syrup. Every time I add corn to a recipe, I feel like it makes the whole dish pretty sweet all by itself! Hope you enjoy my version. This looks so good! I can’t wait to try it. I love that you mentioned topping lettuce with it- great use of the leftovers since it’s a big batch! I would love to see a healthier potato salad recipe, maybe even cole slaw too! Thanks, Jill! Hope you love it. I have been eating it on greens for the past couple of days. Love it. I added your requests to my list! This recipe looks fantastic, I will definitely try it out. If you could create a healthier version of the 7 layer dip, I would be so excited. I love the ones you buy in the stores but know they are full of fat and preservatives. Ok so I don’t know if there is a way to make this healthy but I actually (secretly) love those salads with mandarin oranges, marshmallows, pineapple, etc that are often found at potlucks. I don’t know the name but I’d be fascinated to see a healthier version if you can come up with one!! I have definitely never heard of cowboy cavier, but now I have and it sounds delicious! This looks wonderful! I’ve got cilantro on the porch that needs to be eaten. Perfect! Hope you enjoy this salsa/salad, Ellen! Oooh, looks amazing! I’ve got a potluck this week, and you just solved my problem of what to make. Thanks, Kate! Awesome! Hope this one goes over great at your potluck! I’m making this tonight as a salad since the temp has hit the 80s, maybe 90s tomorrow. Love recipes where you don’t have to turn on the stove or oven in the summer. Any big difference between using the red wine vinegar versus the lime juice in the dressing? I always wonder if the first ingredient listed is the “preferred” one in various recipes. Thanks! Hey Beth! Hope you loved the salad. That’s a great question. I always list the ingredients I used/prefer first, and offer substitutions when I am confident they will be pretty close. It’s always hard to decide if extra information will be helpful or confusing, but I offer options for the accessibility’s sake. Yes I would love healthy versions. Got to try cowboy caviar love everything in it. Ok, I’ll have more for you soon! Hope you love the cowboy caviar, Dolores. I’d love a healthier macaroni salad recipe that still has that tang and creaminess! Looks like such a yummy and perfect summer recipe! Trader Joe’s Cowboy Caviar is great. Not greasy at all. I’m looking for a similar recipe to keep the cost down. Lucky’s is the only store in Santa Rosa, CA that carries canned Black Eyed Peas so I make my own. This looks delicious, I’ve made salads very similar to this and it’s really nice serving in a little gem leaf as a side salad to grilled/BBQ meats. 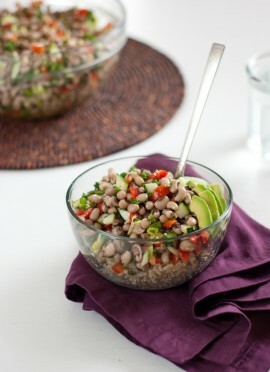 I will definitely be making this salad, I love corn, I’m not sure I can get canned black eyed beans. I shall have to do some research. I’d like to see some bulghar wheat or large cous cous salads. Thanks for the recipe. Thanks, Angela! I found canned black-eyed peas at Whole Foods, but I don’t know where/if they might be available in the UK. You could cook dried beans or substitute more black beans or pinto beans. The salad won’t be as traditional but it will be delicious regardless. I will check out the supermarkets here, I’m sure they have them. Thanks for the pinto beans recommendation, I love them so much. This sounds like the perfect thing to eat when it’s too hot to turn on the oven. 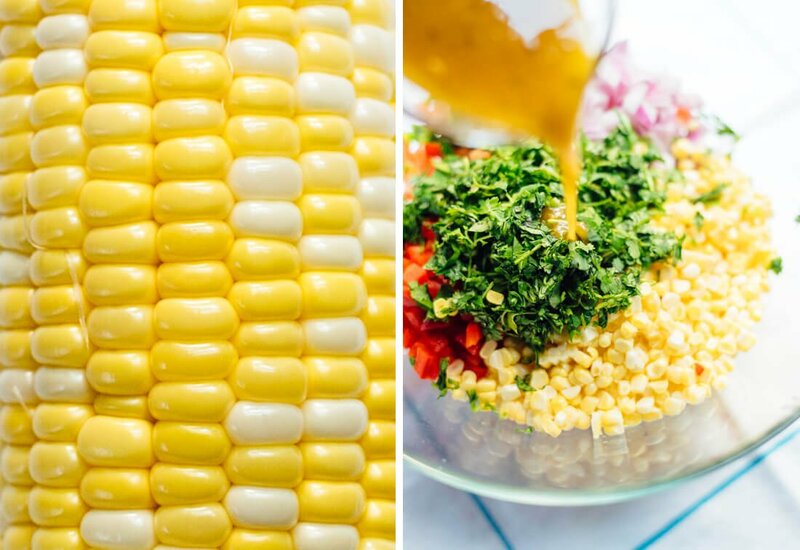 And just look at that gorgeous fresh corn! I need to get my hands on some ASAP. I make something similar with black beans and it’s so delicious! I think the sweet corn is my favorite part! I’ll have to try this version with black-eyed peas sometime soon. This looks incredible! I love everything about it! Yes my daughter made this and it was really good, I think she used black beans and I had to pick them out as I don’t like them :) other than that it was great…. I’m so glad to hear it! Thank you! I hope you both enjoy the burgers! I’m always looking for a healthier version of green bean casserole. Made the Cowboy Caviar today and it is Delish! I used frozen, shoepeg corn from Trader Joe’s. I could eat this every day for lunch over fresh lettuce from my garden. Thank you so much, Cindy! Glad you enjoyed this one! I’ve HEARD of cowboy caviar, but I can’t say I’ve ever had a version that’s even somewhat authentic. You make it look so good I’m definitely going to have to try it at home! If you had a kid they would have the best lunches for school EVER!!! I just made this for a friend’s housewarming party last night and it was a HUGE hit! I couldn’t find black beans, so used all black-eyed peas for this round, and added an extra red pepper just because. Will definitely be making again! I’ve made this twice in the past week! My husband loves it, I love it! I’m 8 months pregnant and am craving fresh, bright flavors so this is perfect. We’ve had it as a side salad, once with chips, once without. We also put it in quesadillas which was fantastic. Thanks for a great recipe! So I figured it was time I thanked you for this recipe :) Recently came across your blog and can’t wait to try more of your recipes! Thanks, Kirsti! glad you found this one! I’m about to try and make this. Was wondering if canned corn ruins the flavor? Hey Matt, I would use fresh if you can find it. Canned corn should be ok, just be sure to drain it well! I LOVE this recipe, and it has become a staple for potlucks- it only takes about 20 minutes to whip together, and it stores easily in the cooler for a day or two if we are going camping or to a music festival. I have made it already 3 times this summer for potlucks and every time I come home with an empty bowl! I also live in Northern California, land of the crazy picky fad diet eaters, and this recipe pretty much works for any dietary restrictions- gluten free, soy free, vegan, dairy free… don’t think it’s paleo because of the beans but you can’t please everyone! I buy a strawberry balsamic vinegar from our local farmer’s market and use half strawberry vinegar, half lime juice. I hardly need any maple syrup that way. People FLIP out for this recipe. THANK YOU!! Hooray! Thank you, Alli! Great point on the special diets issue. I really want to try your strawberry balsamic version! Hi, my name is Katie and I’m 10. I like the recipe a lot. If you add 1-2 tbsp (to taste) of cashew butter to this dressing you get a Vegan Creamy Italian dressing that is out-of-this-world! For my husband and I, it is the go-to dressing for kale. People use their fingers to wipe the bottom of the salad bowl when we serve it! Ha. Give it a try! We can’t wait to buy your book and give you our support. Thanks for the easy recipe! Made this last night and it was a hit! Very simple to follow and it was so delicious! I did not add the jalapeno, I only had black & white beans on hand, did not add basil nor pepper flakes to dressing but it came out amazing! My 9 yr old daughter even packed herself some for lunch this morning! Thanks again!!! Thank you, Vicky! I’m so glad you enjoyed the cowboy caviar. Thank you for sharing this recipe idea, though! I’ll be making it again in the future. Amazing salad! For carnivores as well. Made this today with kidney beans instead of black eyed peas, and put frozen seasoned corn in it (which helped cool the whole salad down by the time I had everything else chopped). Delicious flavor, added avocado separately so it didn’t brown. I may be projecting, but I think people posting recipes must be driven crazy by people always making modifications. That being said… I made so much HCC recently that I needed to deal with a huge bowl of leftovers (no avo, I knew it wouldn’t all be eaten the first day.) I sauté white mushrooms (heart healthy) then add a few scoops of HCC to warm up for a minute. Warm a tortilla, add the magic potion and slices of fresh avo and salsa/sriracha/hot peppers and set myself FREE!!! I’ve made this a number of times from different recipes for different occasions. You’re right that people go crazy for it. I have to say that your recipe is the best so far. The proportions are right, it’s beautiful in the bowl and your dressing is over the top. I made it for my daughter’s birthday party in Phoenix last month and it was gone in a heartbeat. Thanks for publishing, this one is a keeper! Want to make cowboy caviar as Christmas gifts. Like your ingredients. Can it be canned and stored for future use? This is without a doubt one of my family’s all time favorites!! I am constantly being asked to make it for family gatherings. It takes a bit of time to chop all the veggies, but it’s always well worth the effort! Even while my family was away on vacation, we had to make it to have on hand in the fridge. This one’s a winner!! Thanks Kate!! You’re welcome, Sandy! I’m glad everyone likes it so much. Hi there. Thanks for this healthy recipe. I’m going to try to make it today. My husband is going on a plant-based diet for his heart disease, and I would love to find other good, plant-based recipes. He has been a carnivore all his life, and this is going to be a challenge. Thanks. Good luck, Susan! I hope you can find some good recipes here. Check out my Meatless Recipes that Carnivores Will Love list, too! We’re plant-based! I sub vegetable broth for the oil. Tastes just the same. Forgot to take a picture when I made this yesterday for our opening of the deck party season. 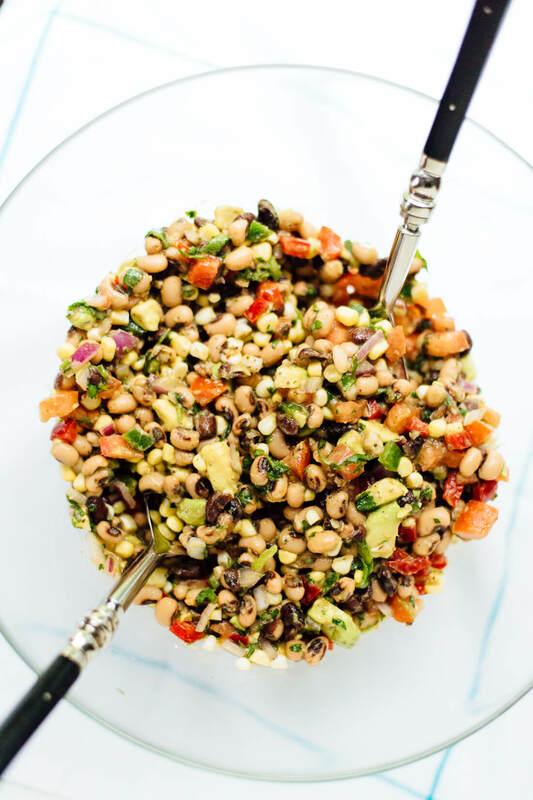 Love this healthier Cowboy Caviar recipe and have made it several times in the past. If I have any leftovers we eat them over a green salad the next day. Delicious with corn chips as well. One substitution that I made was using local green onions from the Farmer’s Market instead of the red onions. I love your blog and have made many of your recipes; keep up the great work! Thank you Coleen! I’m jealous that it’s summer party season where you are– Kansas City is still quite drizzly and cool! So happy you loved the recipe. I love your fresh Mexican recipes! 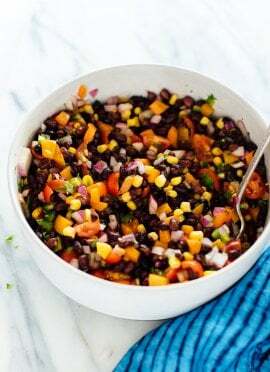 There is so much color and flavor in each bite–red onions, cilantro, corn, tomato, black beans. Ugh, can’t get enough! In addition, I made some baked sweet potato chips to scoop up the caviar, and it added a really sweet taste to the dish. Five stars! Homemade sweet potato chips sound amazing with this, Ally. I’ll have to try that! Made this dip for the lake for the 4th of July. So delicious everyone loves it! Even my husband who would typically not like a dip like this. Super refreshing! Thanks for sharing! It sounds like a hit! Thanks, Wendy. Definitely a crowd pleaser, and I can eat on it for days. I often make it with a can of hominy in addition to or as a replacement for corn. Hominy addition sounds great! Thanks so much for your review and feedback, Meg! Has anyone made this without the oil? Can I omit the olive oil or use balsamic vinegar? Hi Julie – If you want to omit the olive oil, I would replace with another neutral oil (like avocado or something similar). You can increase the lime juice/vinegar to cut down on the oil. For the dressing it needs an oil to make it more of a dressing to help coat. Balsamic would likely be to potent. Hope this helps! If you’re trying to make it “healthy”, why not use dry beans instead of canned? Sorry, I’m not quite following. “Healthy” means a lot of things to different people, so I’m not sure if you’re referencing the sodium content of canned beans (in which case, choose low-sodium varieties) or the potential BPA content in the can lining (in which case, choose BPA-free options, available at Trader Joe’s or from Eden brand, etc.). Otherwise, canned beans are not different from home-cooked beans. Kate I love this recipe it gets requested every time we have a potluck at work.. I only made one minor adjustment by leaving out the bell peppers. I use wildflower honey and fresh lime juice really delicious. Thank you for all your great recipes. I am making this recipe for our condo gathering for Canada Day. It tastes great just like all your recipes. One question about measuring herbs, like cilantro, in this case, or parsley, measure before or after chopping? Great question! For this, measurement is for when it’s chopped. Thanks for the comment and review! It was astounding how little flavor this had. I followed it exactly and made no substitutions. Quite disappointing. I’m sorry you felt that way, Jennifer! You could always increase your favorite amount of seasoning, if you like. Love how quick & easy this recipe is! It’s perfect to bring to large family get-togethers, where I have a couple relatives who are gluten-free and/or vegan and sometimes have difficulty eating from the variety of items at a potluck. I also love that it’s healthier than the version I’m used to at my work gatherings – when given the recipe, i was shocked to learn how much sugar was in it! I made this for dinner last night for the first time. I left out the second can of black eyed peas and used store-bought, pre-prepped chunky avocado instead of fresh and mixed it together even though I wasn’t serving it just yet, and it was so.flippin.good. I can’t wait to make it again. My husband and I ate almost all of it by ourselves, leaving just enough for a taste of it for lunch for me today that I ate as a salad. This is going on my favorites list! Favorite list worthy, I love it! Thank you for sharing, JM.